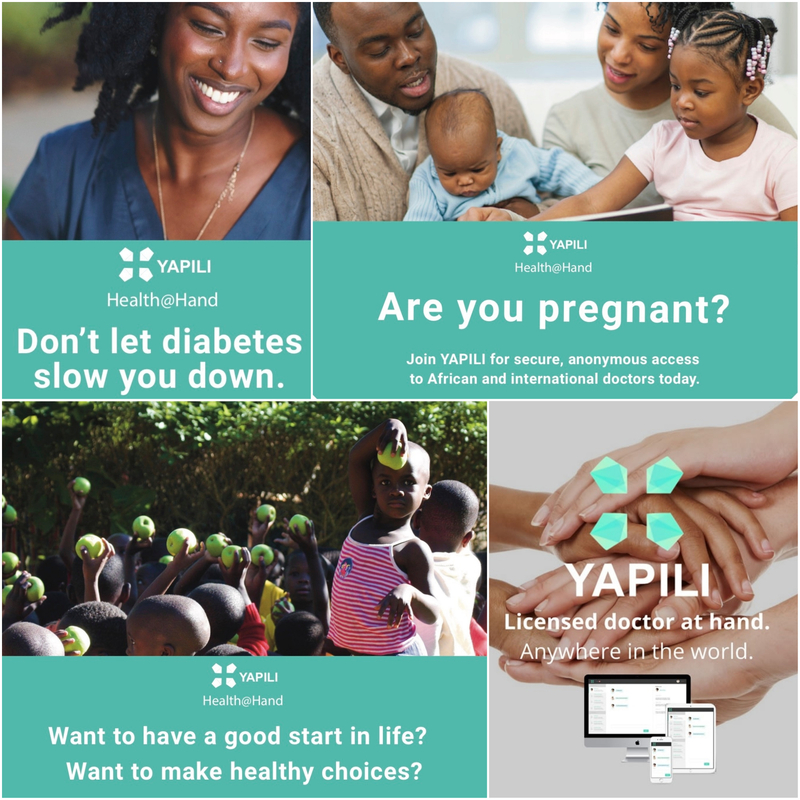 YAPILI connects African users to medical professionals anywhere in the world! We developed a peer-to-peer platform through our app and web platform for African users from 8 countries can connect to practitioners and specialists locally or internationally. We are delivering Health@Hand to enhance access to quality and confidential health advice. By the end 2017, it is estimated that 30% of Africans had a smartphone. People are using mobile technology to interact and enhance the effectiveness of tasks in their daily lives (e.g. mPESA in Kenya). For example, in Tanzania, mobile technology is becoming more affordable, powerful and recurrent even in lower-income regions. In 2015, there were almost 32 million mobile phone users. An increasing number of those mobile devices are smartphones that are mainly used by the youth. As of June 2016, there were 7.5 million Internet users in Tanzania. This figure increased to 23 million Internet users in 2017. With over 6 million Facebook users in Tanzania, thousands are using Facebook groups (amongst other social media platforms) to share medical concerns. This phenomena, which is dangerously trending in many African countries, causes the fast diffusion of medical myths. Now, imagine if we could bring the online youth into our safe community where they can access confidential and reliable health advice? So we thought, what if we could leverage mobile technology to enhance access to healthcare. What if health advice could be at hand? This is YAPILI. We deliver Health@Hand. It is easy to use, maintain and scale. YAPILI brings the innovative model to healthcare and relies on three elements leading it to success at scale: real-time, crowd-based and peer-to-peer. YAPILI leads by example in terms of data privacy and safety and security of the platform. We believe that enhancing access to health in Africa is no longer confined to borders thanks to technological development. The purpose of YAPILI is to decentralize access to quality health advice and centralize medical data. There are multiple issues that we are targeting with our solution. We highlight 6 crucial problems that we are tackling: 1) Shortage of doctors. 45% of WHO member states have less than 1 physician per 1000 population. Sub-Saharan (SSA) countries make up the vast majority of these countries, with most having < 1 per 2000 population. For example, Kenya has a population of 47 million people and there are only 74 psychiatrists! We are leveraging medical expertise in the Netherlands to connect our African user-base. 2) Long waiting times & high patient load. Shortage of professionals leads to an inability to provide effective services, leading to lengthy wait times at clinics. 3) High cost of health services. As much as 70% of health expenditure in SSA paid directly out-of-pocket (compared to a 46% of total health expenditure worldwide). 4) Stigma. Mental and sexual health issues, remain stigmatized, limiting health-seeking behaviours. 5) Limited electronic medical records. The efficiency of data management is limited,(and accuracy of healthdata is questionable. Access to health records remains in the hands of the care provider, not in that of the patients, limiting empowerment to their health status. 6) Access to internet is growing FASTER than access to healthcare. What does that mean? Young people have a quicker access to Facebook groups designated for health concerns, than to their local health facility. An element that is unique to YAPILI is our sustainable, scalable and impact-driven core philosophy which is seen throughout each corner of our business. As a social enterprise, we are impact driven which partly signifies that we want to empower the local stakeholders. We are the only mHealth solution designed for the African market, that lifts borders by connecting African users to doctors anywhere in the world. We believe that the rise in access to technology in emerging markets, allows us to connect people to expertise abroad. Importantly, compared to other telehealth startups, we are driven on data confidentiality and user anonymity. Furthermore, our business model is sustainable is based on 3 revenue streams; including micro-subscription fee, subscription for online campaigns, and subscriptions for aggregated/encrypted data from our YAPILI Data User Interface; which has the ability to prevent or manage epidemics and enhance big data for health analytics in Africa. via real time chat with the chosen doctor regarding the user’s health complaint. Many solutions have tried to expand access to healthcare to Africans via the web, but these solutions have overwhelmingly succumbed due to inability to scale, lack of acceptability of the technology, and unreliable infrastructure. However, inspired by the phenomenon of gig-economy and end-user platforms in other industries, YAPILI brings an innovative model to healthcare and relies on three elements leading it to success at scale: real-time, crowd-based and peer-to-peer. scalability and access for users. We have proven our scalability from launching in 8 African countries and onboarding users and doctors for these countries. These target markets are countries with relatively high connectivity penetration and smartphone access. These are also English speaking African countries, since the first version of YAPILI is in English. There are 365 million online users across the African continent. A good representation consists of showcasing the Facebook users, which is a total of 170 million; representing 47% of our Total Available Market (TAM). Amongst our 8 target markets, 10% of the TAM qualify as English speakers, with access to Internet, and within the 18-35 age age group. This is 41 million users. YAPILI functions beyond borders, which is why scalability is one of our core mission. opportunities include the subscription plans for: 2) Big Data reports and analytics, 3) Referrals to healthcare providers, clinics and pharmacies (directory, appointments, transfer & upkeep of digital user profile and health history, e-prescriptions, payments), 4) Digital Advertising services for digital market outreach towards segmented populations. In this current phase we are bringing new partners onboard, to specify branches of YAPILI (e.g. HIV/AIDS prevention and mental health in Kenya). Hence, we are redesigning the pilot app and web platform to work heavily on software development and to gain more traction and partnerships and eventually launch of revenue model and onboard more users and advisers. The proof of concept was wrapped up with 1000 users onboarded from 8 African countries and 100 doctors from 14 countries (Europe, Africa, Asia). Over 3000 messages were exchanged on YAPILI and around 300 "health cases" were solved. We also have a Masters thesis written about our proof of concept, which discuss the relevance of our solution, the success of our pilot launch and the prospective potential of YAPILI as a disruptive mHealth tool in emerging market. 1000 users from Botswana, Kenya, Nigeria, Rwanda, Tanzania, South Africa, Uganda, Zambia and Zimbabwe. We found that the main health topics discussed were: maternal care, sexual health, diabetes management, lifestyle advice (smoking, drinking, exercise), and mental health. The ratio of men and women was also 50/50. The users' age ranged between 18-24 years old. The majority of users were based in Kenya, Botswana and Nigeria (respectively). We launched our pilot app and web platform which has the ability to deploy a medical questionnaire, record the answers into the user's profile, suggest 3 relevant doctors, user can open/close health cases. Our 2 software developers are in-house, and we partnered with First Line Software for further technological adaptations. We had a leading Dutch legal partner; which incorporated our legal framework for cross-border medical advice. We are part of communities and innovation hubs such as the Botswana Innovation Hub, to increase exposure (for competitions, on-boarding new users, gaining partnerships, etc.) We have since partnered with Sanofi (pharma/Africa) and Aidsfonds (NGO/Netherlands) to support our business model, form further partnerships, obtain investment and reach more users and doctors in Botswana and Kenya. The end-user is not only an individual or patient seeking health advice, but can also be a community-health-worker (CHW) as we have discovered from our pilot. Doctors and health workers in our African markets were signing up as users throughout the pilot. Market in this way, our solution has the potential to link African doctors to specialist expertise in Europe & elsewhere; for educational or second-opinion purposes. We found that mental health was popularly discussed, and especially since there is barely any work done in mental health in Kenya - we decided to focus our partnership with Sanofi on developing a mental health branch for the Kenyan youth. the expected organisation is one that is lean and sustainable within the end of year 2 following expected investment. We are a team of top-tier professionals with experience in different sectors. Importantly, we are all deeply passionate about our solution and about the digital health scene in Africa and we thrive for enhanced access to healthcare in emerging markets. In the core team of co-founders, we have software developers, health-analytics expect, business developers and finance/legal experts. In our local teams (Botswana, Kenya, Nigeria) we have health officers and market activators. We will hopefully do a re-launch following the closure of our pilot in Q1 or Q2 of 2019 with 2 branches focused on HIV/Aids and mental health; currently being developed. The strategy is to re-launch with our business model in place in order to start collecting revenue and make our business sustainable with continuous improvements and increasing reach in our target markets. We focus on our communications and marketing via our strategy B-B-C. We are very active on social media to reach out to potential new users and doctors. We want to continue positioning YAPILI as a medical records solution; and eventually get involved with SAS (Software as a service) to centralise patient information via the YAPILI software in healthcare facilities. We want to build communities on YAPILI, where users can discuss related health concerns with some professionals' feedback. We also want to integrate a professionals community where doctors from the Netherlands (and other Europe/Asian countries) and local African doctors can connect. Regarding the business model, we want to ensure the sustainable and accessible integration of our subscription models by involving employers, telecom operators and insurance companies in collecting users' monthly subscription to the YAPILI services. In the following 2 years, we want to integrate YAPILI into pharmacies, insurance companies and facilities. Through our proof of concept, we were able to identify key markets and potential branch developments of our core solution. As previously mentioned, we are now developing branches in mental health and HIV/Aids management and prevention in Kenya with 2 of our partners (Aidsfonds and Sanofi). Throughout our expansion model of B-B-C, we expect this will maximise a controlled growth, whereby we will be onboarding thousands (and eventually millions) of users with a steady ratio of health advisers to connect them to; in order to ensure YAPILI's quality. We will eventually integrate Artificial Intelligence to deploy a smart questionnaire system, extrapolate personal health details from the user's chat logs and answer some user questions promptly without the necessity for a real doctor. The expected investment (which we are actively seeking) will enable full time employment of 4 co-founders and 11 additional team members, as well as ensure legal & technical basis for service delivery and protection of YAPILI concept and our community. The investment is expected to bring 12M users (30% of Serviceable Available Market) leading to 124M EUR in revenue and 11.5M EUR in profit during year 5. 27k doctors working 40% of their time will be required to reach the scale up. We project that we breakeven at end of year 2 with 0.7M users. As from then on, the platform is self-sustainable with the total cumulative cash position at 20M EUR by end of year 5. As such, the return on investment is projected at x 10.5 within 5 years, i.e. 10.5 EUR for 1 EUR invested. YAPILI has been "live" in 8 African countries since the launch of the pilot. Thanks to rapidly growing mobile technologies across Africa, we are no longer confined to borders to enhance access to health care in Africa. We now have the ability to connect Kenya patients to doctors in Nigeria, France and Japan. However, as it is crucial to empower the local market, which is why we are growing our African doctor-base. Unfortunately, there is a huge lack of medical expertise in the continent at this moment, which can be supported by bringing expertise from abroad. The future for YAPILI goes beyond Africa... but let's first tackle our key markets! decision-making and improvements of care, particularly data on healthcare demand.